You may choose to have braces to improve the look of your teeth and smile. Or you may need to have braces to correct a problem with your bite and keep your mouth and jaws healthy. No matter your reason for getting braces, living life with braces will change your life in several ways. 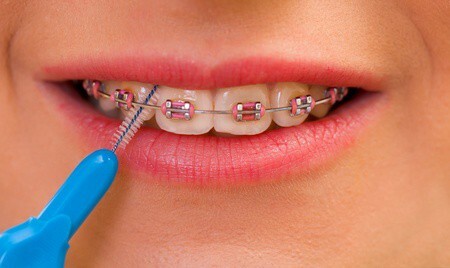 Cleaning your teeth with braces is a bit more challenging than caring for your teeth without braces. Brushing and flossing your teeth during treatment with braces is just as important, however. Orthodontists recommend brushing your teeth after every meal and snack while you wear braces. Brushing this frequently may seem excessive to you, but it is critical not to let food related debris build up in between your teeth while using braces. Dental appliances such as braces, wires, springs, retainers and rubber bands don’t damage or stain your teeth unless you don’t clean your teeth properly. Plaque and food get caught in these appliances and can cause tooth decay and stains if you don’t clean your teeth and dental appliances carefully and frequently. Your orthodontist, Dr. Papandreas can show you proper techniques for brushing and flossing around your dental appliances to keep your teeth healthy and white while they are being straightened. Your orthodontist may also recommend a Waterpik to clean your teeth more thoroughly. Waterpiks clean in between teeth and in between brackets and wires. Waterpiks also reach the hard to reach areas in the back of your mouth to keep that area free of debris. Airflossers work in a similar manner as waterpiks to remove stubborn debris from your teeth. Finish off your mouth hygiene with a fluoride mouthwash to prevent tooth decay and keep your teeth white while they are being straightened. Flossing is crucial to maintaining the health of your teeth, because it removes germs, decaying food and tartar from beneath your gums and around your teeth. Flossing keeps your gums healthy and prevents gum disease. To floss around braces, feed the end of the floss through the main arch wire of the braces and top of the tooth near the gums. Gently move the floss up and down on both of the teeth near the gums. Don’t put pressure on the arch wire of the tooth. Be sure to allow time to complete the flossing process so you can do a thorough job without feeling rushed. Brushing your teeth remains the most important part of your oral care with braces. First, brush your teeth with a soft brush. Brush from the top of your teeth down, and then from the bottom of your teeth up. Then use a proxabrush to clean around and in between your braces. Papandreas Orthodontics uses only the latest advancements in straightening teeth. Our caring, highly-skilled orthodontist and staff will show you how to live your life with braces and help you achieve the glowing, lovely smile of your dreams. Contact us at one of our conveniently located offices in Brunswick or North Royalton for a spectacular smile.